Centre for Social Policy Research contributes spokesman and two projects. On its October meeting, the Senate of the German Reserach Foundation (DFG) approved setting up a new research group "Needs-based Justice and Distribution Procedures" (FOR 2104) at the University of Bremen. The interdisciplinary research group is a cooperation between eleven philosophers, political scientists, psychologists, sociologists and economists from the Universities of Bremen, Hamburg, Oldenburg, Vienna and Jacobs University Bremen. Economist Professor Stefan Traub, co-director of ZeS' Economics Department, will serve as the spokesman of the research group. Moreover, the University of Bremen is involved in the group with political scientists Professor Frank Nullmeier and Doctor Tanja Pritzlaff, both from ZeS' Theory and Constition of the Welfare State Department, and Philosopher Professor Dagmar Borchers. In the first three-year funding phase (2015-2017) the research group will investigate how needs are identified at the individual level and how these needs are then acknowleged at the societal level. Does the process of acknowledging needs converge to a stable equilibrium? What is the impact of needs-based redistribution in terms of economic incentives on the sustainability of welfare states? A special feature of the research group is its interdisciplinarity: each project involves at least two disciplines. Furthermore, all projects will conduct laboratoy experiments, where subjects make realistic distribution decisions. In the long run the research groups aims at formulating a normative needs-based theory of distributional justice that is based on experimental evidence. The members of the research group expect transparency to increases the acceptance of needs-based redistribution at the individual level and expertise to improve overall approval for needs-based redistribution in the welfare state. A DFG research group is a close collaboration of a group of outstanding researchers that work jointly on a specific research questions. Research topic, timeline and funding exceed DFG 's standard procedure for research funding by far. Research groups are usually funded for six years and aim at establishing new research fields. At this point of time the exact size of the DFG grant is unknown, because the written confirmation is still due. ZeS advisory board confirms high standards in research and promotion of young academics. On May 22 and 23 the joint session of the scientific advisory board took place at the Centre for Social Policy Research. Within this framework, the research and teaching performance of ZeS members have been presented to the evaluation committee which was based on a former published annual report. Members of the board are national and international representatives of social policy research and politics. The evaluation report by the board is now available. Besides Chairwoman Waltraud Schelkle (London School of Economics and Political Science), the conference was attended by Jochen Clasen (University of Edinburgh), Silja Häusermann (Zurich University), and Joachim Schuster (Member of European Parliament, Brussels). The participating permanent guests, mainly members of the University Board and the Bremen Senat, included Karl Bronke (Senatory Office of Welfare, Children, Youth and Women´s Affairs), Henning Ehler (German Statutory Pension Insurance Scheme), Ursula Niebling (Senator Office ofEducation and Science), and Kurosch Rezwan (Vice Rector for Research and Young Academics, University of Bremen). In an introductory statement, ZeS-spokesperson Herbert Obinger summarized the developments of the institute. The respective results were based on the previously published activity report for 2012 and 2013. Not only did this report present contributions in the field of interdisciplinary social policy research, both theory- and application-oriented, and the promotion of young researchers. It also revealed changes in personnel and progress in gender equality policies, as well as improvements in scholarly exchange and public relations. Based on these results, the participants subsequently discussed the future parameters for the institute. The first part of the session was followed by two academic presentations, overtly displaying the great variety of subjects investigated in the institute. Simone Scherger, chair of the Emmy-Noether research group "Paid work beyond retirement age in Germany and the UK" - funded by the German Research Council (DFG) - presented the results of her research group. Subsequently, Rolf Müller, Heinz Rothgang and Rainer Unger (Department of Health Economics, Health Policy and Outcome Research) introduced their research projects regarding the subject "Long term care as a challenge for social policy and social policy research". The evaluating report at hand emphasizes that the research conducted by the institute within the past two years is again of particularly high quality and valued on an international scale. This is confirmed by extraordinary statistics concerning publications and external funds. The advisory board further welcomed the ambitious and innovative research perspectives which represent that the ZeS - and its national and international recognized expertise - advances into new subject matters. The next meeting of the ZeS advisory board will take place in 2016. We cordially want to thank the members of the advisory board for their support and the constructive debates! Project on healthcare reforms in East Central Europe. Monika Ewa Kaminska has been awarded a four year M8 Independent Postdoctoral Position within the Excellence Initiative to carry out her research project "Healthcare reforms and state desertion in East-Central Europe: privatizing healthcare, privatizing risks". The project comparatively analyses healthcare reforms in East-Central Europe (ECE). It sets to identify the triggers behind risk-privatization trends in ECE healthcare and explain variation in "state desertion" levels across the region, and explores modes of institutional change (abrupt vs. incremental). It examines the social impact of healthcare reforms by bringing into focus patients’ and health workers’ perspectives and studying the stratifying effects of ‘re-commodification’ and privatization of ECE healthcare systems. Finally, it embeds the healthcare systems in the political economy models. The sample consists of eight post-communist countries: the Czech Republic, Estonia, Hungary, Lithuania, Latvia, Poland, Slovenia, Slovakia. The analysis covers the twenty five years of post-communist transition (1989-2014). The project applies a synthetic analytical framework combining a neoinstitutional approach with an analysis of domestic tranformative agency and external influence, and combines qualitative and quantitative data analysis. Efficiency and Equity of the German "Energiewende"
German Ministry of Education and Science grants research network of the University of Bremen concerned with the acceptance of Germany's "Energiewende". Climate change is one of the pivotal challenges for the human race. The German Energiewende does not only lead to a technological transformation of the energy system, but also makes private households' energy consumption more expensive. Social science behavioral research has shown that the acceptance of a reform like the Energiewende at the societal level crucially depends on the perceived equitableness of the individual distribution of financial burdens. The research network "The societal acceptance of the Energiewende (AKZEPTANZ)" is coordinated by the Technical University of Clausthal and will receive about 900,000 Euros in the next three years. The subprojects "Philosophical and Behavioral Aspects" of the University of Bremen are directed by Professor Dagmar Borchers (Institute of Philosophy) and Professor Stefan Traub (ZeS, Economics Department) and will be endowed with 400,000 Euros. 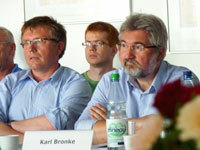 The project will carry out research on the societal acceptance of the Energiewende, based on individual preferences. In contrast to opinion polls that assess attitudes, the project will focus on actual energy consumption behavior in the scope of field experiments and by means of an energy-consumption household panel (directed by the project partner RWI, Essen). From the behavioral reactions of households on different funding schemes for the Energiewende, the project will derive economic policy conclusions for carrying out the Energiewende. Apart from economic efficiency of funding the Energiewende, the project focuses on aspects of equity: How can the financial burdens of the Energiewende be distributed among households in a just manner that avoids social hardships (like energy poverty)? The research network is accompanied by an advisory board consisting of the German Federal Consumer Association, the German Federal Association of the Energy and Water Industry, the Confederation of German Trade Unions, several electric utilities and other partners. In April 2013, Kristin Bothur has started her new position as research coordinator at the Centre for Social Policy Research. The coordination of the Master Programme "Social Policy" has been transferred to Irina Wiegand. Since April 12, 2013, Kristin Bothur is the new research coordinator of the Centre for Social Policy Research succeeding Christian Peters. The planning and coordination of the interdisciplinary working institute’s research perspectives as well as the extension of national and international cooperation and public relations belong to her new responsibilities. Kristin Bothur began working at the Centre for Social Policy Research in November 2009, at which she was responsible for the planning and conceptualization of several research projects in social sciences - for instance, the research network “Welfare Societies” and its corresponding activities. She is also an Affiliated Fellow at the Bremen International Graduate School of Social Sciences (BIGSSS), since 2012. Her dissertation is on the socio-economic status of freelancing musicians in Germany. Before working at the University of Bremen, she studied political and administrative science and philosophy in Erfurt, Konstanz and Toronto. Since April 1, 2013, the Master program “Social Policy” of the Centre for Social Policy Research is coordinated by Irina Wiegand. Her main tasks are advising interested persons, mentoring students and building up an alumni network. Besides that, she aims at the extension of international cooperation in academic teaching. One current project is to transform the cooperation with the University of North Carolina at Chapel Hill into a Double Degree Program. After her studies in Political Science, Roman Literature and Languages and International Relations, Irina Wiegand gained first experiences in coordinating a study program at Jacobs University Bremen. She then worked at the University of Bremen and completed her doctorate with a stipend of the Bremen International Graduate School of Social Sciences (BIGSSS). In the previous years, Irina Wiegand held several positions at universitary institutions. After a break of three years, the advisory board of the Center for Social Policy Research met for an on-sight visit on 10th May 2012. The following speakers were present: Dr. Herbert Rische (Präsident, Deutsche Rentenversicherung Bund), Dr. Waltraud Schelkle (London School of Economics), Prof. Dr. Annette Zimmer (Universität Münster) as well as guests of the advisory board: Dr. Carolin Balzer from the Bremen Science Administration, the deputy head of research of the University of Bremen, Prof. Dr. Rolf Drechsler, the chancellor of the University, Gerd-Rüdiger Kück, and finally Staatsrat Dr. Joachim Schuster. that the academic value of the years 2009-2011 as regards quality and quantity is extremely high and meets demanding international standards. This concerns the production of articles and books as well as the choice of the reported magazines and publishers. The high scientific standard is also shown in an active international exchange, which is maintained by each department and likewise by the whole institute. that the institute provides and excellent and visible contribution to the social political discussion in Germany due to its broad range of topics. that the institute provides a specific and recognizable contributions towards teaching at the University of Bremen with an innovative and constantly internationalizing Master in Social Policy as well as M.A and B.A courses in "Public Health". last but not least the promotion of young researchers and especially female researchers which is exemplary at the ZeS. The most striking example is the Emmy Noether junior research group on the topic "Paid work beyond retirement age in Germany and the UK" which represents the plurality of methods and the transdisciplinarity of the institute. The next advisory board meeting including on-sight visits and evaluation will be taking place in 2014. In order to bridge the time gap and to intensify the content-related integration of the board of trustees, the ZeS will also in 2013 be offering different formats of cooperation (lectures, workshops, conferences). Invitation from the ZeS, the InIIS, the EMPAS, the BIGSSS and the Collaborative Research Centre 597. Social sciences already played a key, although not always uncontroversial, role in research and teaching during the founding and first years of the University of Bremen. A breakthrough was reflected in 1988 by the Collaborative Research Centre 186 (Status Passages and the Life Course) through the merger and rising profiles of various social science research fields - it became the first Collaborative Research Centre at the University of Bremen to ever be funded by the German Research Association (DFG). In the years thereafter, a cornerstone was laid for strengthening the social sciences toward excellence. As a result the initiative shown by social science research facilities such as the Institute for Intercultural and International Studies (InIIS), the Institute for Empirical and Applied Sociology (EMPAS), and the Centre for Social Policy Research (ZeS), the founding of the Graduate School of Social Sciences (GSSS), funded by the Volkswagen Foundation, and a successful application by the Collaborative Research Centre 597 (Transformation of State) were possible. Now known as the Bremen International Graduate School of Social Sciences (BIGSSS), cooperation with Jacobs University Bremen is supported through funds from the Excellence Initiative by the Federal Government and Federal States. In 2011, BIGSSS submitted a renewal application. After four decades, social science research has developed into one of the most prominent research areas at the University of Bremen. There are thus plenty of reasons to celebrate with all of those who have made this development possible. After the move to the Unicom-Building on Mary-Somerville-Straße ZeS is closely located to other university research and teaching facilities. After nearly 20 years in the centrally located, historical Barkhof-Gebäude, ZeS once again finds itself in a modern and spacious functional building. A change of location was regularly discussed due to the constantly growing reduction of space at the institute during the past few years. A concrete need for action became evident after the Senate’s decision that the ‘Barkhof’ would return to its original use as a school. The new location led all involved parties to promise a greater amount of networking with other teaching and research facilities at the University as well as a significant simplification of cross-institutional work procedures.